“The British Virgin Islands (BVI) offer shorter hops from island to island than some other Caribbean luxury yacht charter locations, and the waters tend to be more protected,” says Barbara Dawson, senior charter broker for Camper & Nicholsons. And, she says, the area is “an ideal spot for first-time charter clients to get their feet wet!” On Tortola, the capital and largest of the BVI’s 60-plus islands, wander around Road Town’s spice, soap and rum shops or head to 96-acre Sage Mountain National Park, where trails meander up to the BVI’s highest point (1,716 feet). Afterward, cruise to pretty Cane Garden Bay before continuing west to Jost Van Dyke, where adults may wish to swim to the Soggy Dollar Bar for a “Painkiller.” From Jost, veer southeast around Tortola to 610-acre Norman Island, a hiding place for pirates’ booty that may have inspired Robert Louis Stevenson’s novel Treasure Island. This is a great place to begin an underwater treasure hunt, snorkeling near eagle rays and yellow tail snapper at the Caves site and fairy basslets at Spyglass Wall, before continuing northeast to private Peter Island, where you can dock in the marina and soothe your pirate stresses with a Thermal Sand Bundle Massage at the resort’s spa. Moving northeast, snorkel Cooper Island’s Cistern Point, then press on to Virgin Gorda, which reels in mask-clad humans at The Baths, a series of granite boulders that create sheltered pools alongside a beach. Finally, cruise north to Anegada, the BVI’s only coral island, where you can continue your treasure hunt scouting for turtles and huge groupers around the 1853 wreck of the Parmatta — one of the best shipwrecks in the world to dive. Top tips: Must dive The 310-foot-long wreck of the Rhone, a Royal Mail Steamer that sank during a hurricane in 1867, is the BVI’s most celebrated scuba diving site. Its two main parts lie off Salt Island, at a depth of 30 to 80 feet, within the BVI’s first and only marine park. On the southern end of Virgin Gorda is The Baths, where granite boulders form a rocky playground. Seafood Safari The fresh spiny lobster on Anegada is so popular, it has its own annual festival. On November 28 and 29, find out what the fuss is about on a seafood (and cocktail) safari, as local chefs serve up sample lobster dishes at participating restaurants. From Jost, veer southeast around Tortola to 610-acre Norman Island, a hiding place for pirates’ booty that may have inspired Robert Louis Stevenson’s novel Treasure Island. This is a great place to begin an underwater treasure hunt, snorkeling near eagle rays and yellow tail snapper at the Caves site and fairy basslets at Spyglass Wall, before continuing northeast to private Peter Island, where you can dock in the marina and soothe your pirate stresses with a Thermal Sand Bundle Massage at the resort’s spa. Moving northeast, snorkel Cooper Island’s Cistern Point, then press on to Virgin Gorda, which reels in mask-clad humans at The Baths, a series of granite boulders that create sheltered pools alongside a beach. Finally, cruise north to Anegada, the BVI’s only coral island, where you can continue your treasure hunt scouting for turtles and huge groupers around the 1853 wreck of the Parmatta — one of the best shipwrecks in the world to dive. The 310-foot-long wreck of the Rhone, a Royal Mail Steamer that sank during a hurricane in 1867, is the BVI’s most celebrated scuba diving site. Its two main parts lie off Salt Island, at a depth of 30 to 80 feet, within the BVI’s first and only marine park. 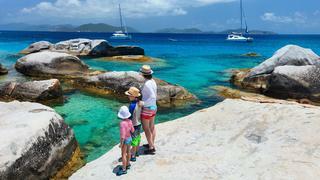 On the southern end of Virgin Gorda is The Baths, where granite boulders form a rocky playground. The fresh spiny lobster on Anegada is so popular, it has its own annual festival. On November 28 and 29, find out what the fuss is about on a seafood (and cocktail) safari, as local chefs serve up sample lobster dishes at participating restaurants. Why is Alaska’s Inside Passage such an ideal destination for families? Patricia Codere, charter manager at Fraser Yachts in Fort Lauderdale, loves the “great fjords with calving glaciers, giant icebergs, whales and sea lions” — natural wonders that are sure to melt hearts and inspire glacier-size smiles in family members of all ages. Start your seven-day journey, through one of the best ice destinations to visit on a superyacht, in Juneau. Let the Mount Roberts Tramway whisk you 1,800 feet up the mountain for views over the Gastineau Channel or embark on a helicopter flightseeing tour, where you’ll land on a glacier and soon be peering into mysterious blue crevasses. The Mendenhall is one of 40 major glaciers that flow from the 1,500-square-mile Juneau Icefield; another is the Taku, one of the few glaciers in the world that is advancing. From Juneau, cruise west to Glacier Bay National Park, a sanctuary for humpback whales. Spend the day watching, mesmerised, as whales breach and harbour seals float past on icebergs, occasionally jumping at the sound of thunder as the park’s seven tidewater glaciers calve and lose lofty blocks of ice to the sea below. 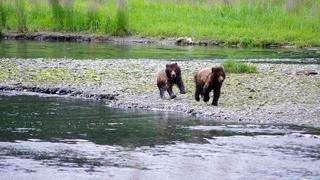 Satiate other senses with a dip in the natural pools at Baranof Warm Springs to the south, and then cruise along the southern tip of Admiralty Island to Pybus Bay, where you’re almost certain to spot brown bears along the shoreline. It also has the world’s greatest concentration of nesting bald eagles (5,000-plus). Cruising northeast, visit magnificent Tracy Arm fjord, which weaves for more than 30 miles. Then spend your last day back in Juneau, hiking and possibly stopping by the Alaskan Brewing Company to toast a wondrous week in the wild. Top tips: Must do Landing on one of the Juneau Icefield’s glaciers via helicopter is a thrill in itself, and children will be doubly excited to meet Alaskan huskies and go dogsledding while there. Be brave In Hoonah, west of Juneau, test your vertical bravery on the 5,330-foot ZipRider at Icy Strait Point. Your family might laugh if you scream, but they probably won’t blame you. Why is Alaska’s Inside Passage such an ideal destination for families? Patricia Codere, charter manager at Fraser Yachts in Fort Lauderdale, loves the “great fjords with calving glaciers, giant icebergs, whales and sea lions” — natural wonders that are sure to melt hearts and inspire glacier-size smiles in family members of all ages. Start your seven-day journey, through one of the best ice destinations to visit on a superyacht, in Juneau. Let the Mount Roberts Tramway whisk you 1,800 feet up the mountain for views over the Gastineau Channel or embark on a helicopter flightseeing tour, where you’ll land on a glacier and soon be peering into mysterious blue crevasses. The Mendenhall is one of 40 major glaciers that flow from the 1,500-square-mile Juneau Icefield; another is the Taku, one of the few glaciers in the world that is advancing. From Juneau, cruise west to Glacier Bay National Park, a sanctuary for humpback whales. Spend the day watching, mesmerised, as whales breach and harbour seals float past on icebergs, occasionally jumping at the sound of thunder as the park’s seven tidewater glaciers calve and lose lofty blocks of ice to the sea below. Satiate other senses with a dip in the natural pools at Baranof Warm Springs to the south, and then cruise along the southern tip of Admiralty Island to Pybus Bay, where you’re almost certain to spot brown bears along the shoreline. It also has the world’s greatest concentration of nesting bald eagles (5,000-plus). Cruising northeast, visit magnificent Tracy Arm fjord, which weaves for more than 30 miles. Then spend your last day back in Juneau, hiking and possibly stopping by the Alaskan Brewing Company to toast a wondrous week in the wild. Landing on one of the Juneau Icefield’s glaciers via helicopter is a thrill in itself, and children will be doubly excited to meet Alaskan huskies and go dogsledding while there. In Hoonah, west of Juneau, test your vertical bravery on the 5,330-foot ZipRider at Icy Strait Point. Your family might laugh if you scream, but they probably won’t blame you. “ New England is an easy and wholesome location to take families,” says Jennifer Saia, president and charter specialist for B&B Yacht Charters. Highlights include safe and quaint strolling streets, history and learning opportunities and protected anchorages for water sports, notes Saia. “And it’s the idyllic place to go sailing, (enjoying) charming lighthouses, beautiful coastal vistas and opulent summer mansions that line many towns.” Begin in Newport, Rhode Island, where Gilded Age mansions overlooking the ocean await exploration. The grandest, the Breakers, belonged to the Vanderbilts, as did Marble House, which was inspired by the Petit Trianon at Versailles. Let your imagination wander as you navigate their interiors, then set out on the scenic, three-and-a-half-mile Cliff Walk, which travels just behind these “cottages” along the cliff edge. Twenty-two nautical miles to the south is Block Island, where public beaches, hiking trails and a circa-1867 lighthouse entertain visitors. To the northeast are the Elizabeth Islands, which are mostly owned by the Forbes family. The largest, Naushon, has the chain’s only remaining lighthouse, circa-1891 Tarpaulin Cove. From here, the journey to Martha’s Vineyard and its five lighthouses is blessedly brief, as is the cruise farther east to Nantucket. The latter’s historic district (which encompasses the entire island) is “the finest surviving architectural and environmental example of a late-18th and early-19th century New England seaport town,” according to the National Park Service. The Nantucket Preservation Trust runs architectural walking tours twice a week in summer and private tours are available. Top tips: Lobster ice cream? Yes. Ben & Bill’s Chocolate Emporium, which has a shop in the Vineyard, sells lobster ice cream, which is butter-flavoured and includes cooked, chopped, buttered lobster meat. Must do Cycle some of the 44 miles of down-island bike trails on Martha’s Vineyard, including the predominantly flat, thus family-friendly, 18 miles from Vineyard Haven to Oaks Bluff to Edgartown and back. 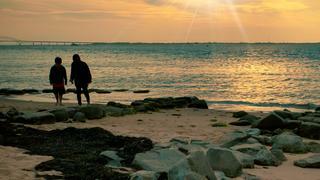 Begin in Newport, Rhode Island, where Gilded Age mansions overlooking the ocean await exploration. The grandest, the Breakers, belonged to the Vanderbilts, as did Marble House, which was inspired by the Petit Trianon at Versailles. Let your imagination wander as you navigate their interiors, then set out on the scenic, three-and-a-half-mile Cliff Walk, which travels just behind these “cottages” along the cliff edge. Twenty-two nautical miles to the south is Block Island, where public beaches, hiking trails and a circa-1867 lighthouse entertain visitors. To the northeast are the Elizabeth Islands, which are mostly owned by the Forbes family. The largest, Naushon, has the chain’s only remaining lighthouse, circa-1891 Tarpaulin Cove. From here, the journey to Martha’s Vineyard and its five lighthouses is blessedly brief, as is the cruise farther east to Nantucket. The latter’s historic district (which encompasses the entire island) is “the finest surviving architectural and environmental example of a late-18th and early-19th century New England seaport town,” according to the National Park Service. The Nantucket Preservation Trust runs architectural walking tours twice a week in summer and private tours are available. Yes. Ben & Bill’s Chocolate Emporium, which has a shop in the Vineyard, sells lobster ice cream, which is butter-flavoured and includes cooked, chopped, buttered lobster meat. Cycle some of the 44 miles of down-island bike trails on Martha’s Vineyard, including the predominantly flat, thus family-friendly, 18 miles from Vineyard Haven to Oaks Bluff to Edgartown and back.